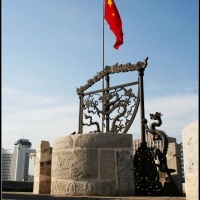 The ancient observatory in Beijing China, once part of the city walls, is one of the hottest attractions mounted on the battlements of a ten-meter watchtower. 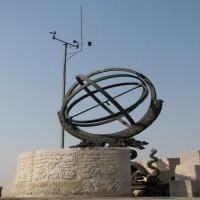 As one of the oldest and famous observatories in the world, it covers an area of 10,000 square meters. Likewise, the Ming and Qing Emperors relied heavily on astrologers before making a move. The present Beijing Observatory was built in 1437 to 1446, not only to facilitate astrological predictions but to aid seafaring navigators. Downstairs are displays of navigational equipment used by Chinese shipping. On the first floor are replicas of five 5000-year-old pottery jars, unearthed from Henan Province in 1972 and showing painted patterns of the sun. There are also four replicas from the Han Dyanasty - eave tiles representing east, west, north and south. There is a map drawn on a wooden octagonal board with 1420 stars marked in gold foil or powder - it's a reproduction of the original, which is said to be Ming Dynasty but is based on an older Tang map. Busts of six prominent astronomers are also displayed. 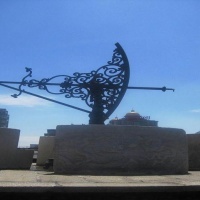 One the 'roof are a variety of astronomical instruments designed by the Jesuits. The Jesuits, scholars as well as proselytizers, found their way into the capital in 1601 when Matteo Ricci and company were permitted to work with Chinese scientists. The Emperor was keen to find out about European firearms and cannons from them. The Jesuits outdid the resident Moslem calendar-setters and were given control of the observatory, becoming the Chinese court's advisors. Of the eight bronze instruments on display (including an equatorial armillary sphere, celestial globe and altazimuth) six were designed and constructed under the supervision of the Belgian priest Ferdinand Verbiest, who came to China in 1659 to work at the Qing court. The instruments were built between 1669 and 1673, and are embellished with sculpted bronze dragons and other Chinese craftwork, a unique mix of east and west. 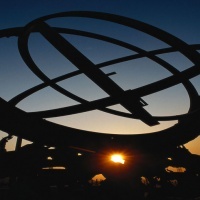 The azimuth theodolite was supervised by Bernard Stumpf, also a missionary; the eighth instrument, the new armillary sphere, was completed in 1754. It's not known which of the instruments on display are the originals. During the Boxer Rebellion, the instruments disappeared into the hands of the French and the Germans - some were returned in 1902, others came back under the provisions of the Treaty of Versailles (1919). Bertrand Russell's comment:"The observatory the Jesuits set up in Shanghai was used for meteorological predictions - and still used for that purpose. They even had some influence over architecture in Beijing, and designed the Italian rococo palaces at Yuanmingyuan (the Old Summer Palace) using Versailles as a blueprint. 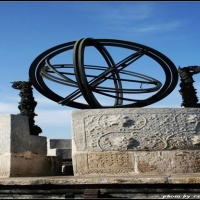 The Beijing Ancient Observatory is located in the southwest side of Jianguomen crossroad at Dongcheng District. It is open 9:00-11:00, 13:00-17:00 (after 16:00, it is not allowed to enter in), closed on Monday and Tuesday. The only thing that isn't astronomical is the entry fee: RMB 10. Traffic Prompt: lots of buses and arrive there in Changan Street and Erhuan Road, get off in Jianguomen subway station of circle line for those who take straight line. 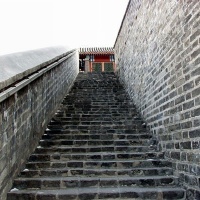 Tips: these years, the Beijing Ancient Observatory has been very popular with those who are inquisitive and the family tour groups from home and abroad.